BNB IS NORTH CAROLINA’S PLATFORM DEDICATED TO CULTIVATING THE FOUNDING ELEMENTS OF HIP HOP CULTURE. 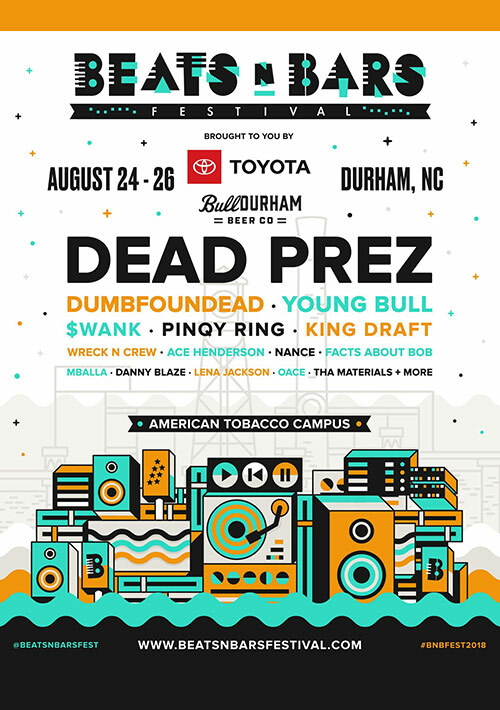 THE FESTIVAL IS A THREE DAY IMMERSIVE HIP HOP EXPERIENCE THAT TAKES PLACE IN DOWNTOWN DURHAM, NC. Beats n Bars’ mission is to build stronger community through the influence of urban culture and music. In order to meet this goal and place NC Hip Hop, and Durham specifically, in national conversations related to Hip Hop, BnB aims to establish relationships, build partnerships, and foster collaboration with individuals and businesses for support. BnB curates a diverse mix of performances from some of the best artists in Hip Hop locally and nationally. The lineup represents a variety of styles and showcases the the dynamic range of Hip Hop music. The festival showcases are both a recognition of artists making their mark and a celebration of the contributions from established trailblazers.